A bathroom’s cabinetry and vanity mirror offer much more than just storage and functionality. It’s also a luxury bath’s centerpiece for decorative aesthetic. 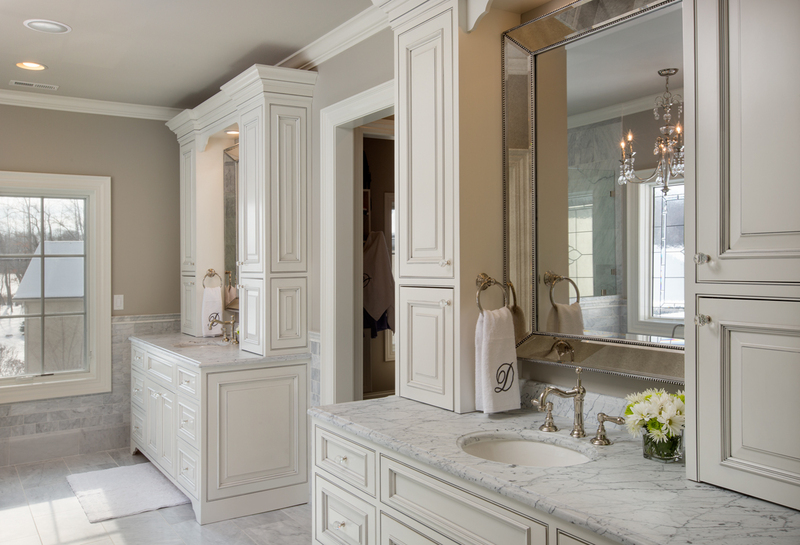 Often nestled along the sink, your bathroom cabinets can help set the tone for your own spa-like retreat, complete with luxury, style, and personality! Along with the wide selection of materials, finishes, and hardware, a luxury bath would be incomplete without the highest quality craftsmanship and attention to detail involved with creating custom cabinetry for luxury bathrooms. That’s why DreamBaths is proud to have Holiday Kitchens as a custom cabinet supplier. Holiday Kitchens: Handcrafted Cabinetry for the Bathroom, Too! Holiday Kitchens makes custom, hand-crafted cabinets not only for kitchens but for the luxury bath, as well. With the myriad of styles, tones, and materials available, Holiday Kitchens models each detail of their luxury cabinet with exceptional materials and craftsmanship, creating truly custom bathroom cabinetry tailored to the way you and your family live. Their commitment to the values and traditions of their founders solidify a firm commitment to their product as well as their highly skilled employees. Are you ready to take the next step toward your own Dream Bath?